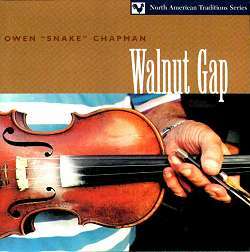 This is Owen Chapman's second CD for Rounder and should go high on the shopping list of followers of traditional Southern US fiddling. Chapman is from the small town of Canada up in Pike County, Eastern Kentucky. During his early years this area was pretty isolated as were many Appalachian communities, as Chapman says "If you lived thirty miles from a fiddle player you didn't know about him, about all there was around home was banjo players". In fact he himself started out on banjo, playing 'drop thumb' style, but then the fiddle took over. Owen's father George was apparently an excellent fiddle player who learned much of his repertoire from Owen's uncle Hense Chapman. It seems that Hense quit playing fiddle around the year 1910 meaning that much of Owen's repertoire has come down in a pretty direct line from the latter part of the last century without being influenced by radio or recorded performance. This doesn't mean that Owen himself has not been affected by the wonders of the electronic age. He has a vast repertoire which, apart from the very old tunes learnt from family and friends, he picked up from radio and records. Like many of the old time musicians he seems to have the ability to remember a tune and repeat it with all of it's idiosyncrancies with very few listenings, perhaps only one in the case of radio broadcasts. There being 32 tracks contained on this disc which has a playing time of 62 minutes plus, some listeners may find some of the tracks a little short, but personally I don't feel that this is a problem. With such a large repertoire there are as well as the lesser known tunes a number of tunes which are known under a different title, I'll Go Home To My Honey for instance is an instrumental version of the Binkley Brother's song later recorded by Doc Watson - Give Me Back My 15 Cents. This information plus much much more comes from the excellent booklet accompanying the disc. There is also of course the occasion where a familiar title turns up attached to a tune other than the one which you were expecting. Accompaniment is mostly supplied by Paul Smith's three finger style (not bluegrass) banjo picking with the guitar of Bert Hatfield and sometimes the guitar of Roger Cooper added. There are also some tracks of solo fiddle but even where the other instruments are present it is the fiddle that comes through with Smith's sympathetic banjo lending full complementary support, the guitar(s) quietly laying down a solid base. Mark Wilson, who is responsible for producing this album and its very informative booklet, has been responsible for at least seven previous albums in this series of Kentucky music from Rounder. Anybody familiar with his previous efforts will know what to expect and this lives up to the high standards which he has already set. His immediate family heritage probably reaches back as far as anyone still alive at the end of the 20th century. His father, George 'Doc' Chapman, was born around 1850 (he was 67 when Snake was born) and thus learnt his music from the antebellum generation. Consider this - Snake learnt fiddle when he was "eleven or twelve" off a father who must have been around 78 by then. If Doc had done the same he would have been learning off someone born in 1783, a mere seven years after the Declaration of Independence! On one level this is nothing special - many of the older fiddlers recorded in the 1920s and 30s played music rooted in the antebellum era - but there can be few fiddlers still alive able to claim this level of musical antiquity. It is a sobering thought that two of Snake's uncles fought in the Civil War! Snake, however, is a 20th century musician. Whilst his initial influences were his father and the older players he met around Williamson (notably Ed Haley), it was the great Radio and Contest fiddlers of the thirties and forties he most tried to emulate in his youth, particularly (and predictably) Arthur Smith. For a long time he played little of his older heritage, his main interest lying in the popular 'Hillbilly' music of the era, playing first with Clayton and Russell West as the Kentucky Redbirds (heavily influenced by the Delmore Brothers and the Dixieliners) , and then with Molly O'Day (Laverne Williamson) and her brother Cecil, though his music never lost the connection with dancing - much of this work seems to have been for square dances, and not just for radio and concerts. In the '60s Snake almost inevitably got into Bluegrass, and one gets the impression he was a decent Bluegrass fiddler - he remains good friends with Kenny Baker - while in more recent times he has rediscovered the music of his father's generation and become involved in the Old Time revival - full circle. It's clear Snake's playing has gone through many changes of repertoire and style. In particular it seems he aped Arthur Smith's so-called long-bow technique for a long time. Nowadays he reckons to have totally abandoned long-bow and to be playing very like his father, though he stresses that ultimately he plays most 'like himself' - i.e. after a lifteime's immersion in this music he inevitably has his own distinct style. If we are to broadly categorize this style then Snake is, I think, what south-easterners call a 'hornpipe fiddler'. This doesn't mean he plays midwestern style music - southeastern hornpipes are usually the simpler 18th century type, the complex Victorian 'Competition Hornpipes' favoured in the mid-west are rarely heared in the South. Indeed, it doesn't always mean someone who plays mainly hornpipes (though a large number of Snake's tunes are either hornpipes or 'quasi-hornpipes') it refers to a 'notey' approach that gives even reels, polkas and the simpler breakdowns a hornpipe feel. Judging from the content of these two CDs, nowadays Snake's repertoire seems too fall into three main categories. Firstly, the music he learnt off his father and the older generation of local fiddlers at the very start of his career, secondly a number of rare and excellent tunes learnt in the '30s and '40s off radio programmes like the Opry and the Renfro Valley Barn Dance, and thirdly his own compositions. Whilst I personally am more interested in the first two groups, in many ways it is his own compositions that best demonstrate both his impressive technical skill and his keen musical ear and memory. The bulk of the self-compositions presented here consist of the 'progressive old time' that younger fiddlers rely on in contests or use to make people sit up and take notice when the session is waning at 3 a.m. It's the sort of music Old Time fiddlers play to sound progressive and Bluegrass fiddlers play to sound old-time. The chief characteristics of the genre are melodic complexity and the heavy use of attention grabbing devices like minor keys, key changes, the inversion of conventional chordal patterns, and the insertion of unusual or eccentric passages - tunes like the minor-key Gina Lisa, or Molly's Tune with its semitonal runs, or the dual-key Cat Tracks with it's unusual phrasing and chord sequences, amply demonstrate his mastery of this genre. They do, however, present certain problems. Firstly, there has to be some question as to how far they represent Kentucky tradition or Illinois tradition, because Doc's father came from Illinois. Though Snake reckons his grandad probably wasn't a fiddler, he does confess to some uncertainty and to knowing little about his grandparents (not surprising when you're born to a 67 year old father). Whilst basic musical ability isn't that rare, in Snake and Doc's music I detect a special quality - a particular creative genius - and the phrase 'must run in the family' keeps nagging! When you read that Doc's brother Hense was possibly an even better fiddler than Doc you do start to wonder. Certainly I think we have to admit the slight but definite possibility that Doc's tunes and style derived from his family rather than his neighbours and were rooted in Illinois. What is not open to doubt is that much of the special character of Doc's music derives from Doc himself, who seems to have possessed a deeply original and creative musical mind quite equal to his son's. At least two tunes here are credited as original Doc Chapman compositions (Pat Him on the Back and Doc Chapman's Breakdown) and they are possibly the two most fascinating and unique melodies in the entire collection, particularly the latter with it's striking key shift within the part. To give you some idea of the tune's unique and weird character, Snake recalls "I thought he was just practicing � I didn't think he was even playing a tune". The creative input of Doc Chapman in much of his other material shows in the repeated appearance of elements of Old Molly Hare/Fairy Dance, strong echoes of which occur in at least five out of the 18 tunes stated to be sourced from Doc, which seems beyond the bounds of coincidence. There is also the question of Snake's input - Snake is after all another intensely creative musician. For example, does the strong hornpipe flavour to Doc's tunes represent their original form or Snake's interpretation? Snake is notorious for imparting a hornpipe feel to all his material and for making simple tunes complex ("sometimes if I play a tune and it ain't got enough in it, I'll put more in it to make the tune �") and many of these tunes he has hardly played since childhood. Still, Snake himself seems fairly certain he plays this stuff very like his father. All in all, these are two remarkable CDs which seem to improve with every hearing. The back-up musicians, Snake's friends and neighbours Bert Hatfield and Paul Smith (joined on Walnut Gap by Roger Cooper) are excellent, getting the balance between letting the fiddler shine and playing good, creative music just about right; the presentation and notes are as superb as in all Mark Wilson's projects; Snake's personal memories are an absolute goldmine of information; and for anyone interested in the roots of Southern fiddle music a thorough musicological analysis of Doc Chapman's tunes should be extremely revealing. I personally found Chapman's Hollow the most entertaining and the most interesting, as it contains the highest proportion of Doc Chapman's tunes and other older material - indeed, I'm inclined to think it should be in the collection of any serious Old Time fiddle fan - but both albums are absolutely, totally, unreservedly recommended. (1) In contrast to his outstanding musical memory, Owen's memory for dates and the minutiae of daily life is, like the rest of us, somewhat vague and approximate. For example, he tells us that his father was born in 1850 and was 67 when Snake was born in 1919. Or again, he says he started in the mines at 19, worked for 31 years before retiring, then worked in Detroit in 1966. Add the figures yourself! None of this is terribly out, but it does suggest this kind of detail doesn't get priority in his memory banks. * he notes that Arthur Smith's playing was far more traditionally south-eastern and less like Texas 'long-bow' than he's usually given credit for. His observations on Ed Haley's playing are worth noting too - Snake is quite certain that the available recordings of Ed Haley's playing are not truly representative and are far more modern and 'ragtime' than he normally played. * he's fairly clear that the music of his area was very different from that around nearby Pikeville where they favoured cross-tunings and a 'lonesome sound' - and hence, almost certainly, the key of A. Although he plays several tunes in A, Snake rarely uses cross-tunings and his favoured key is G which is quite unusual I think - a rough count suggests 28 tunes in G to only 14 in A, 13 in D and 5 in C (whoops, that adds up to 60 and there's ony 58 listed � sorry I'm not doing it again). Doc clearly liked G as well, though his material contains almost as many A tunes - 10 in G, 7 in A, and only 1 in D (it's tempting to wonder if these different regional and family patterns reflect older ethnic, class or temporal divisions - e.g. between English, Scotch-Irish, and German settlers, or between the descendants of indented servants and richer immigrants, or between descendants of the original tidewater settlers and later immigrants. Even if it did I doubt it could be proven - traditional music is too fluid and elusive, the time gap too large, the original groupings too intermingled, the documentation too sparse). * One feature of Doc's technique also shared by Ed Haley and other older fiddlers is I think deserving of particular mention. This is the practice of moving the fiddle as well as the bow. When I first read about this practice I couldn't comprehend what was meant and suspected the observer was mistaken, but I found too many other references, particularly from England, Shetland, and the American south. It had me perplexed until the early 1980s when I saw a film of some Rumanian fiddlers - as the B-part of the tune moved into the higher octave, and hence up to the top strings, over went the fiddles with the angle of the bows unchanged! Doc of course had his own slant on this, and was given to suddenly jerking the fiddle to catch a particular note. * Snake comments that at a big Square Dance the sets could be so large it might take 15 minutes to complete a dance. I repeat this here to emphasise that the modern practice of playing three/four minute tune sets reflects the tyranny of the early recording process and the 'three minute single'. It is amazing how far this tyranny still holds sway in popular music, despite the LP and the CD. In most traditions it was normal to play until the dancers tire and Snake's 15 minutes is not at all unusual. Much of the creativity in traditional dance music comes from playing one tune for these kind of extended periods - the modern practice of playing three or four minute sets composed of two or three separate tunes inevitably produces much mediocre music. This is not just an issue in traditional music - for example, live tapes of Swing and Jump bands in the '30s and '40s show dance hall versions of their numbers to have been much longer and far more creative than their records. (3) It's called Jerry and Tom to avoid confusion with Tom and Jerry, the title of several traditional dance tunes in both Britain and America. I've always presumed the various Tom and Jerries to be named after the heroes of Pierce Egan's popular Regency low-life novel Tom and Jerry, or Life in London (a damnable good read Sir!) or from the drink that was named after Egan's heroes (or was it the other way round?) Snake's Jerry and Tom however refers to two of his numerous cats. On Mark Wilson's last estimate Snake had around sixteen cats. Anyone with sixteen cats is OK in my book, regardless of their fiddling abilities - especially when his mother's name was Blackburn, which means there's probably a Lancastrian somewhere in his ancestry. (4) Despite the persistent 'mountain' image that sticks to Southern fiddle music, it is arguably the low country tradition that has been the most creative and vital during the 20th century, and the ultimate source of many of the era's key innovations, particularly the blending of the blues/ragtime and breakdown traditions which lies at the heart of Bluegrass and Western Swing fiddling. The main difference between the Southern low country and the mountain regions is of course the former's large black population, and the 'lowland' taste for rags and blues-inflected breakdowns is usually presented as reflecting black influence. It is certainly hard to avoid casting this in the usual terms of an interplay between 'black' and 'white' traditions, but I'm inclined to find this model simplistic and inadaquate. At the very least it requires some important and rarely made qualifications - firstly, while present knowledge seems to suggest blues, ragtime and jazz were originally created by black Americans, from as far back as documentation takes us white musicians have been deeply and creatively involved in their development, and whilst 'Old Time' music can be shown to be primarily rooted in European tradition, as far back as documentation goes, black Americans have been playing it too. Indeed, the starting point in this kind of continual cross fertilization may not always be where we presume - there is some evidence for example that Jazz was originally a white form, while a whole body of the most typically American old-time tunes seem to be of minstrel show and hence possibly black origin. It follows from this that the simple model presented by black nationalists and white liberals in which whites 'rip off' black music, and the white racist side of the same coin in which 'jungle rhythms' corrupt helpless white youth, represent a crude, ignorant, and absurd travesty of the complex reality of a deep and continual interplay between black and white tradition in which it is not always clear quite what is black and quite what is white or where the starting point for analysis actually lies. From a British perspective much discussion of these issues in America seems immature and more a reflection of America's profound racial problems than a serious attempt to understand the music. (5) Snakes's 1958 list reads like a kind of mid-twentieth century Southern fiddler's 'top of the pops'. This radio and record derived 'hit parade' has since come to form the core Old Time/Bluegrass repertoire - the sort of tunes the budding fiddler starts off with. Whatever the ultimate origins of the specific melodies this repertoire is now the universal language of the Southern fiddler, regardless of regional background or chosen generational style. It enables Texans and Virginians, Old Time, Bluegrass and Country Swing fiddlers to sit down together and boogie. Indeed, much of this repertoire is now shared with mid-western, northern and Canadian fiddlers and is familiar even in Britain and Europe (and not just to revivalists - the Suffolk fiddler 'Eely' Whent used to play an astonishing version of Turkey in the Straw, which seamlessly incorparated fragments of Ragtime Annie, Chicken Reel and other mid-20th century American fiddle hits. He always said he 'learnt' it off an American flyboy in a Woodbridge pub, which probably means he heard the guy play several tunes and his brain merged them into one on the way home - an excellent example of what 'learning' a tune can mean in folk tradition). (7) * That Highland pipe music is conventionally written in A is probably coincidental. In their time Highland pipes have ranged from G and possibly F to the present Bb. That their music is written in A reflects the nominal pitch of the late 18th and 19th centuries. Other British bagpipes have equally varied in their pitch. * I suppose this inevitably raises an issue that crops up from time to time - the abscence of bagpipes in the American south, given that the bagpipe was the favoured instrument of the medieval European peasantry and was still played in most areas of Britain and Europe when immigration to the Americas began. There is no real mystery here. The major source of white immigrants to the colonial south was southern England and the bagpipe was already becoming old-fashioned there in the 17th century. By the 18th century it had been almost entirely ousted by the new Italian violin (though Hogarth and other sources show it maintained some existence in London itself into the mid-18th century). Immigrants from southern England in the 17th and 18th centuries simply reflected the fashionable taste of their time and place - the fiddle was the new king. One could counter that settlers from northern England, Scotland and Ireland when added together would have made at the least a large minority, and that bagpipes not only continued to be played in these regions but entered on an era of quite unprecedented experiment and development during this very period, giving rise to bellows pipes, miniaturized pipes, harmonizing regulators, overblowing and keyed chanters, ultimately leading to the appearance of the Northumbrian and Union models, the most sophisticated bagpipes in history. But even in north Britain and Ireland the violin was the trendy flavour of the age - the very intensity of 18th century bagpipe development in those areas reflects a counter-revolution rather than a revolution. Ultimately smaller, quieter pipes and overblowing or keyed chanters simply reflect frustration at not being able to play the new pop music, a need to adapt to fashions set by the violin. Moreover, there is plenty of evidence that North British, Anglo-Irish, and Scotch-Irish immigrants tended to represent the more progressive and better-off elements within their communities, frequently of strong religious persuasion - in general not the sort of people most given to piping or fiddling. When we seek to identify the regional and social roots of Southern music we continually come back to one core group: the southern English lower class of the 17th and 18th centuries, and in Britain they were the very group that was most thoroughly abandoning the bagpipes and embracing the fiddle. Bagpipe music is another matter. As well as developing new forms beyond the restrictions of the bagpipe scale, colonial era fiddlers inevitably played much of the older music, a great deal of which had been moulded by the bagpipes. Indeed, one reason for the popularity of the violin was its versatility - it could render the old music with a sound very similar to the pipes but play other music far beyond the bagpipe's limitations (it was also considerably easier to maintain and transport). In Britain the relatively large body of written fiddle music remains a prime source of tunes and knowledge for those hunting down old bagpipe music. So it is not in the least surprising to find apparent bagpipe tunes in the South but no history of bagpipes. (8) As with the relationship between black and white tradition in the states, we now enter an area where confusion reigns and things are not always what they seem. 'Scotch Measure' was of course primarily a dance not a tune classification, thus whilst the name suggests the dance was an import into southern England we don't know whether the type of melody used was a northern import or whether southern fiddlers already played melodies of this type, nor do we know how longstanding and deep rooted the form actually was in any region. Indeed, it's not even definite that the dance in question originated in Scotland, because in 17th/18th century southern England 'Scotch' is frequently a dismissive shorthand for 'Northern English or Scots' (this attitude is still with us, hence the popular southern jibe that 'Scotland starts north of Watford Gap' - which does actually recognize an important cultural reality, in the study of folklore/popular culture northern England and lowland Scotland cannot realistically be separated). Don't relax, it gets even murkier, because the practise of giving home-grown tunes/dances an exotic 'foreign' image and of writing imitations of the supposed music/dance of other regions was well established even back then - for example, many well known 18th century 'Scots' and 'North Country' melodies appear to have been written by London hacks, and it would not be at all surprising to find they also invented the Scotch Measure! The widespread practice of lifting huge chunks from other peoples publications and incorporating them in alleged regional/national collections doesn't help - early Scots and Irish collections in particular lifted whole chunks from even earlier English collections, and the apparent greater integrity of the early English collections only reflects being first in the field - we have no way of telling what they might have borrowed. If the common-time Hornpipe is (possibly) a southern reworking of a northern form, it has been suggested the Reel may (possibly) represent the opposite - a Scottish reworking of the English Country Dance, the key feature being the halving of the note values (though I personally am inclined to place some emphasis on tinkering with triple-time tunes - see final paragraph). Reels emerged about the same time as the hornpipe, and became extremely popular throughout Scotland and to a lesser extent northern England, but in southern England they tend to be represented only by a few widespread 'pop hits' like the Devil's Dream (the southern English title for Devil Among the Tailors), the Fairy Dance, Miss McLeod of Raasay, Moneymusk and Lord MacDonald - interestingly, the same body of tunes which best represent the reel in the American south and, until the form suddenly took off sometime in the 19th century, in southern Ireland. That is, they represent a special group of widespread 'hits' rather than the genuine absorbtion of the form within these regions. To confuse matters further, hornpipes are occassionally referred to as 'reels' in southern England, but that simply reflects the popularity of the reel as a dance - southern English players tend to classify their tunes by the dance rather than the tune structure (thus the commonest modern name for a hornpipe in southern England is probably 'step-tune' from the vigorous step-dancing they typically accompany. Hornpipes are also sometimes called 'breakdowns' in England which is a fairly good description of what excessive stepping on a bellyful of beer can do to you). Looking back over the last 300 years we can see a basic pattern in which the hornpipe appears as southern English and the reel as Scots with northern England as a border zone where both find favour. Ireland of course absorbed both into a unique pattern of its own. All this is a pretty good metaphor for culture in the British Isles generally! This discussion is even further complicated by the presence in British tradition of the 'old', 'triple-time' or 'double' hornpipe, a form of tune usually cast in 3/2. These tunes preceded the common-time hornpipe and for a while co-existed alongside it, gradually retreating northwards and disappearing from the working repertoire by the early 19th century (though they still have a tenuous existence in Northumbrian tradition). In general these tunes bear little structural resemblance to the common-time hornpipe, and any attempt to render them into common-time tends to produce tunes so like reels that I suspect tinkering with the double-hornpipe must have been an important factor in the evolution of the reel.